means with enough makeup even I could be beautiful ? such a miracle on me. A 24 pic. slide show of the Flea Market a few weeks ago. 7. Law of the Bath - When the body is fully immersed in water, the telephone will ring. He spent 22 seasons with the Detroit Tigers, with the last six as the team's player-manager, and finished his career with the Philadelphia Athletics. He set 90 records during his career, several of which he still holds today. He is widely considered as one of the greatest players of all time, but his legacy as an athlete has sometimes been overshadowed by his surly temperament, racism, and aggressive playing style. 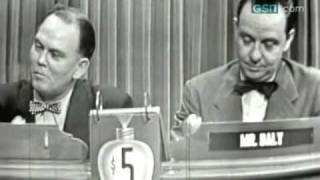 Was the final episode of "What's My Line?" Sept. 3rd 1971 - John Lennon leaves UK for NYC, never to return. This has nothing to do with with anything for this newsletter. I just thought that it was cute, and wanted to share with you.